Ralph Breaks the Internet keeps reminding us of its place in our own world. When contemporary animated features create fantasy worlds, they want those worlds to interact with our understanding of our own world—and whatever benefits accompany that choice, it comes with some baggage as well. From Monsters, Inc.'s Monstropolis and the anthropomorphized mindscape of Inside Out to the animal-populated world of Zootopia and the digital landscape of the new Ralph Breaks the Internet, we're fed a steady diet of referential punch lines as a kind of comfort food, making that world feel more familiar in its connections to our own: "They're so slow at the DMV, amiright?" The flipside of that approach is an impediment to immersion, because we're repeatedly getting reminders that the movie's world exists only in relation to our own. Sometimes, the distraction is minor bordering on irrelevant. And sometimes, it makes it hard to latch on to whatever the movie is trying to say. 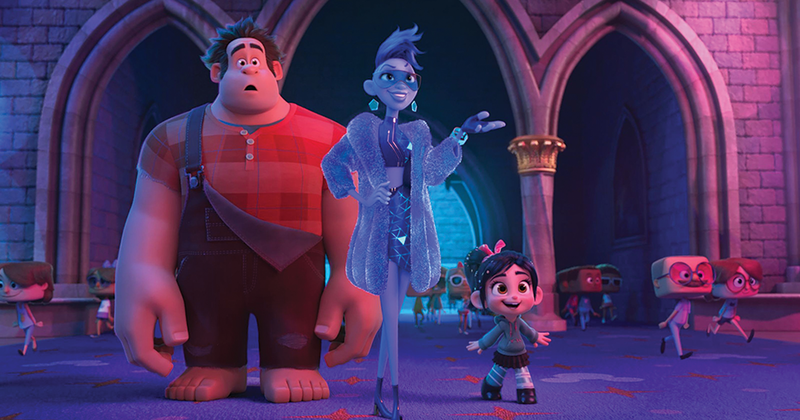 Ralph Breaks the Internet, as the title would suggest, moves from Wreck-It Ralph's self-contained world of video arcade games to the World Wide Web—and in so doing, offers the promise of doing more than regurgitating the plot of the original with new jokes. Six years of actual time has passed since the events of the first film, and the friendship between Ralph (John C. Reilly) and Vanellope (Sarah Silverman) has grown to be one of the most important things in both of their existences. So when a user breaks the steering wheel on Vanellope's Sugar Rush game—which means it would be unplugged, leaving Vanellope homeless—Ralph sets out to find a replacement part in the mysterious world of the internet. Naturally, that means encountering characters and situations built on our understanding of the way the online universe works, and quite a few of them land their gags. Alan Tudyk voices a search engine called KnowsMore that's perpetually jumping the gun on auto-filling information requests; Taraji P. Henson plays social-media influencer Yesss, with a savvy awareness for how to get users' attention; an uncredited Bill Hader captures the neediness of a personified pop-up ad called Spamley. The returning creative team of co-writers/co-directors Rich Moore and Phil Johnston might go for some obvious ways to present a concept visually—it's no creative brainstorm to turn the "dark web" into a shadowy back-alley—but they keep the story clipping along in a way that doesn't make 112 minutes feel like 112 minutes. They also find a solid character hook in Ralph's growing fear that he might lose Vanellope when she discovers new challenges in an edgy racing game called Slaughter Race, and a new pal in its super-cool heroine (voiced by Gal Gadot). Reilly's voice performance carries over the insecurities that drove Ralph in the original film, and the notion of allowing people to have their own opinions and lives—which gets a wonderful visual representation in a monstrous version of Ralph that's all roiling, unthinking desperation—certainly clicks in a movie set in the often-toxic online world. The problem is that this central concept is also related to Vanellope's growing desire to find new challenges beyond the familiar ones of her own game—and it's kind of hard to take that idea seriously in a franchise sequel, from the company that has spent most of the past five years doing nothing but cannibalizing its own back-catalog for familiar, easy-to-market characters. Here's where reminding us of our own world collides with the movie's own story: Don't try to sell me the importance of taking risks in new places, if it's in this particular package. That notion comes home to roost even more awkwardly in the sequence that has been at the center of the film's marketing: Vanellope's encounter with the entire lineup of Disney princesses, within the greater online Disney world. Some of the jokey references are cute, and Vanellope even gets a chance for her own satirical spin on an "I want" song co-written by Alan Menken. But smiling corporate synergy is still corporate synergy, and Ralph Breaks the Internet gets sapped of its own emotional energy whenever you can't ignore its part in a monolithic cross-marketing strategy. The charm of a fantasy often comes from its ability to transport you. For all its individually effective moments, Ralph Breaks the Internet mostly aims to transport you to disney.com.